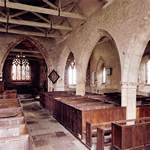 The Church of St Bartholomew, Lower Sapey, is now owned by the Churches Conservation Trust, but prior to their ownership it had been allowed to fall into a sad state of disrepair.The specification required a sympathetic restoration programme, the result of which was to make it appear as though we had never been on the site! Externally, structural pinning work was required to hold the four corners of the Nave together and in a stable state, despite previous attempts using steel straps. Repairs to the window tracery were also needed. Replacement leaded lights were supplied and fitted, the remains of the originals having been examined carefully in order to recreate the lead came design as accurately as possible.The roof tiles were stripped, the rotten battens replaced with new split oak lath, and the tiles were then reused on the main slopes.The North face of the Chancel was re-roofed with new handmade tiles. The vaulted ceiling inside was in a precarious state and traditional techniques were used to hold the existing lath and plaster in place.The missing areas were replaced with new oak lath and lime plaster. The gallery at the west end was re-instated, complete with its narrow staircase. External plaster consolidation was carried out and the replacement of missing lime render on two of the elevations completed the external works. Minor repairs to the timber framed porch gave the final touch to the works on this picturesque church. 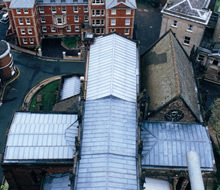 This project was in contrast to our work on another of the Churches Conservation Trust buildings in Shrewsbury, where the lead roofs on the Nave, Chancel and Transepts were stripped and relaid, and consolidation of the stonework was carried out. 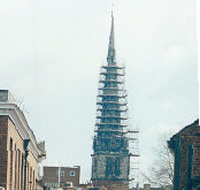 The Church of St Mary has one of the tallest spires in the country and a phase of restoration has been carried out during which substantial dressed stone replacement as well as conservation and repointing has taken place. 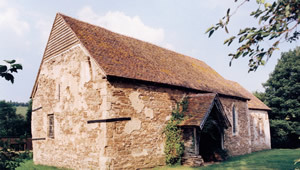 The Church of St Bartholemew, Richards Castle, is a 15th Century church set in the rolling hills of North Herefordshire and over the last ten years a wide variety of work has been carried out including extensive repairs to the roof structure, stone consolodation and restoration of the internal joinery. 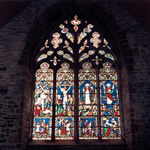 Many of the leaded lights have been removed in order to replace the lead cames, whilst retaining the original glass, some of which is mediaeval in origin. 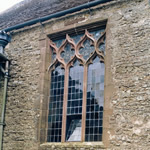 Stone repairs to many of the windows have been carried out using a variety of red sand stones in order to match the original. St Bartholomew’s is an unusual Church in that it has a separate Bell Tower at the East end which was suffering from movement at high level.This has been corrected by the combined use of grouting, stitching and the insertion of ties, invisible from the exterior. 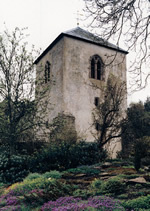 Works to this 13th Century Bell Tower have included the conservation of the remaining render to the South and East elevations and the rerendering of the other two sides with a lime render. Many of the buildings in the South Shropshire and North Herefordshire area were rendered in former days in order to protect the soft silt stones with which they were constructed.